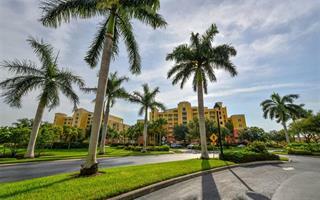 Ask a question about 130 Riviera Dunes Way #ph103, or schedule a tour. 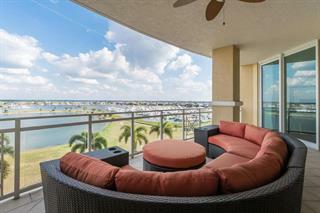 Water views from every room in this Bel Mare penthouse residence which has over 3700 square feet. Conveys with a 2 car garage under the building plus a parking space and large storage locker. 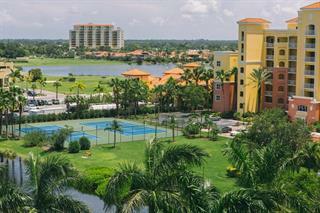 The views are magnificent overlooking the d... more.eep water marina and the Manatee River. Enjoy the best of both worlds as you view breathtaking sunrise and sunsets. Arrive via your private elevator entryway and be awestruck by the views from every room. Formal living area has custom bookshelves, fireplace (Dimplex Opti-Myst), and back-lit wall of onyx. 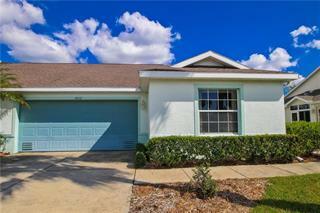 There is custom crown molding plus tray ceilings and custom mirrors in living room and hall. Cooking in this kitchen will be a delight with the large breakfast bar, double ovens, 6-burner gas stove, and breakfast nook. Not only does this home have an elegant master suite with wet bar but also a guest suite that is similar to the master with a wet bar and large closet. In addition to the 2 master suites, there is an additional guest room plus a den. All bedrooms are ensuite and the balcony wraps around most of the residence. All windows are hurricane rated. 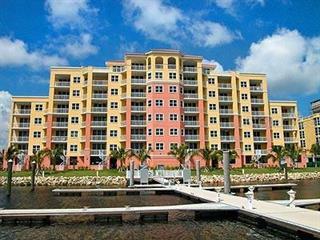 As an owner you can enjoy endless amenities including a guard gated entrance, secure building, private storage unit, two assigned garage parking spaces under building, updated fitness center with state-of-the-art equipment, media room, three pools, social room & guest suites available for rent.